The striped red mullet is a reddish colour that can vary depending on its mood. 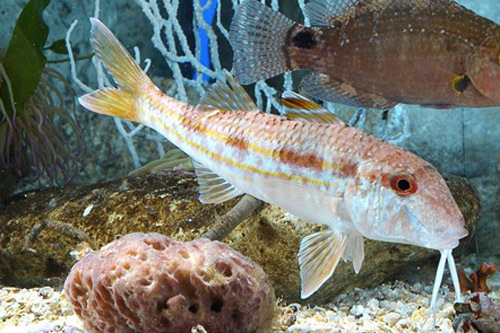 Two highly characteristics touch barbs come out of its lower jaw, which it uses to detect the food in the sediment. It is a fish not usually more than 25 cm long, though on occasions it can reach 40 cm. It is a gregarious animal that usually goes around in small groups. It swims alone or in groups of up to 50 individuals. It has omnivorous feeding habits: it feeds on crustaceans, poliquets, molluscs and algae. It usually forms small groups to look for food together. Two highly characteristics touch barbs come out of its lower jaw to detect the food in the sediment. They are capable of digging holes as deep as themselves in search for food. Its reproduction is oviparous and they normally lay eggs in spring and summer. The young expurgate rocks covered with seaweed in shallow waters of around 1 m; on the other hand the adults live on the sand and mud from 3 to 90 m deep. It lives in the Mediterranean, the eastern Atlantic from the English Channel to Senegal and in the Black Sea. Its meat is very tasty and has been considered an exquisite dish since antiquity.